Summary: With 150 intensity levels and an intelligent training system, this top of the range men’s ab toning belt makes for an ideal way to tone those abdominal muscles. Excellent user feedback for this belt – check this Amazon.co.uk product page for more. Abs toning belts work by delivering electronic muscle simulation (EMS) through pads which target those stomach muscles effectively. This Slendertone belt has 10 different muscle toning programmes, which include three advanced sports active programmes. You can also adjust the intensity levels of the belt from 0 to 150. This ensures that you train your muscles at a comfortable level for you. Twenty minutes of use with the belt is the equivalent of doing 120 sit ups and the EMS ensures that you recruit the entire abdominal structure. 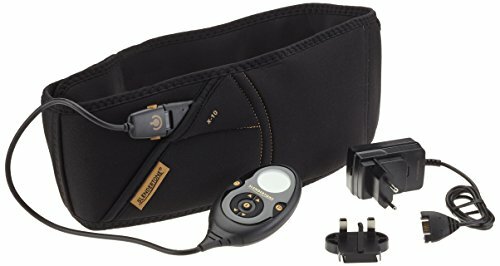 The controller for the belt is both rechargeable and interchangeable and is suitable with all Slendertone arm and bottom accessories. The belt features an intelligent training system which will automatically progress you through the programmes. In comparison with other abs toners, this is in the slightly higher price bracket, but a nice discount at amazon sees the cost come down. This belt does have some added advantages over the more budget items, especially when it comes to the 150 adjustable levels and the ten different programmes. The reviews for this item are almost overwhelmingly positive. The presentation of the equipment is said to be great, almost Apple-esque, adding a great amount of polish to your purchase. The belt has a nice sleek design and is comfortable to wear. A number of users have stated that they are ‘amazed with the results’, although as is the case with any abs belts, it works in conjunction with a workout and will not magically make the fat disappear, just strengthen the muscles. The Slendertone Men’s Premium Rechargeable Ab Toning Belt is ideal for those who want to tighten those abdominal muscles. Expecially those who don’t have the time for doing those crunches or sit ups. The adjustable levels and the programmes ensure the EMS is targeted to ensure it is right for you. Check out this dedicated product page for the gallery and feedback from buyers!